Portable concrete building. However we are open to negiotate in sharing the removal costs. THIS WELL DESIGNED GREEN PRODUCT GRANNY FLAT. Most of the panels just need to be screwed together, very easy for all handy man. Our technicians are more than happy to assist you with all the queries. Certified transportable. 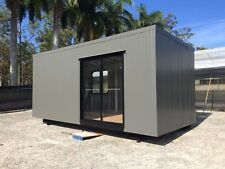 We can do larger 1 bedroom and two bedroom transportable cabins also. 40mm stone kitchen. Full floor to ceiling tiled bathroom. The Log Cabins Aus Austen backyard cabin is constructed using 45mm T&G boards and its unique construction gives a strong, well insulated cabin that is ready to paint or stain. No internal lining is required. Building has been designed to utilise insulated roofing panels, therefore removing the need for roof trusses, and giving the interior a gabled ceiling. Fastener kit. Has 3 doors plus full double doors at the rear. (Like a container). I can load it here, arrange transport on a tilt tray. FREE: Shingle roofing tiles. FREE: Floor insulation. FREE: 19mm floor and roof boards. FREE: Laminated timber, double glazed doors & windows. 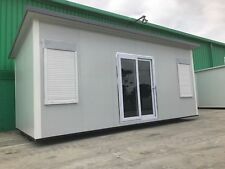 The "Cabin,Portable Building, Donga" consists of 9.8x3.3m building. Aluminium sliding windows 900x900,1200x900 & sliding glass door set. IF YOU CAN FIND CHEAPER LET US KNOW AND WE WILL DO OUR BEST TO BEAT THAT PRICE. This cabin is in used condition, it has insulated walls and roof with eco wool insulation between gyprock and outer slat timber. Inside in good condition, roof is coloured bond green. It has been used in our backyard as an extra bedroom and/or storage. Fiberglass Shower Cubicle. Showers are located in Campbellfield Victoria 3061. Height 1980mm. Depth 740mm. Width 900mm. Cabin Tiny Home Granny Flat Man Cave. Condition is Seller refurbished. Furniture removal truck body converted to a tiny cabin. Walls, door, roof have been fitted and painted. No power. Dimensions 4.2m x 2.3m. Cabin lined with 2.0 eco wool insulation. Inspections and queries welcome. Located at Fountaindale 2258 NSW. Can be removed via flatbed truck or similar. Great little weekender or granny flat for out the back. 2 rooms, bedroom and bathroom. Tiny house and generator. It’s wired up like a caravan so you just plug power into the side. so it isnt classed as permanent. We have available a fully refurbished Granny Flat, Portable, Moveable, Tiny House that is fully transportable, Relocatable and For Sale. Reverse cycle Air conditioning. Large Bedroom with outside access. THIS BUILDING WAS USED AS AN OFFICE AND IS FULLY INSULATED AND WATER TIGHT. 3 AIR CONS. TRANSPORT BY TILT TRAY TRUCK. CEILING HEIGHT- 270CM (8'10"). FRONT MODULAR HAS 1 SLIDING GLASS DOOR WIRE DOOR 2M WIDE. The kids are on their PlayStations or personal computers, your partner's on the internet working or just surfing. Is the fight to get on-line becoming a real chore?. If so, then why not create your own garden computer room. Length: Approx 10ft. You are hiring a used, wind and watertight storage container. We’re able to rectify, alter and fix anything that you aren’t happy with regarding the storage container. Features: Standard Container Doors Or Roller Doors with Lock and Key. Skylight for great natural illumination. LED lighting. Screens on all windows and sliding door. Condition is Used. Second window 372cm (w) x 183 cm (h). 4845(L)x2500(W)x1970(H) ,7 power points,waterproof plywood interior walls, freshly painted, aluminium sheeting on theoutside. We have this new 2850 wide x 5150 long x 2400 high portable building. Whether it be a site office, craft room, extra bedroom. PORTABLE OFFICE/SITE SHED/RELOCATABLE. We may be able to assist with transport. 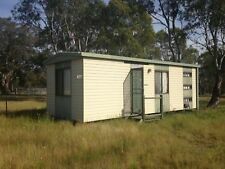 Large, used Premier Granny Flat or 'Dependable Person's Unit' in excellent condition. - Full seperate laundry with spacious linen closet. - Hot water unit. - Full kitchen with upright stove/oven/range and large pantry plus dishwasher cavity (dishwasher not included). Large shed, 60 X 16 x 10 colorbond portal all bolt together. Suit farm or will make 2 smaller sheds. Has a nice Dining area, Lounge Room, Toilet and Shower, Great Kitchen with lots of cupboard space with big Pantry. Kitchen is mostly new and has new floating floor boards through out the kitchen and dining room. 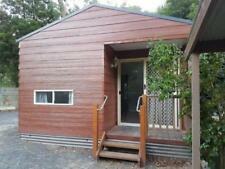 Transportable 1 Bedroom Park Cabin - 38m2 - $23,500! C-Purlin Galvanised Floor System. - Horizontal Corrugated Iron Wall Sheets & Flashing - Shale Grey. - Sliding Glass Windows & Doors. (Integrated Modular Building System). - Optional different level of accessories (Adjustable footing, interior cladding, floor finish,ceiling, exterior wall finish, guttering). - Choose your desired colour for verandah floor, interior & exterior cladding and ceiling. The footprint is 4.2m x 2.4m however expansion options are available. Fully certified and we provide assistance with council approval. First pre-order gets 10% off! Living room. Attractive, affordable, prefabricated. Attractive, affordable, prefabricated. Affordable Value for Money, Latest Expandable Modular Technology, Fast and Easy Setup. Fully wired including all electrical power-points, lighting, main power board with circuit breakers and external Caravan style plug-in power inlet. Ø Bathroom: includes minimum 3 Star accessories, toilet suite, shower basin with shower curtain with flick mixer tap on vanity,, plus shaving cabinet with mirror. Ø Bathroom Accessories: Towel rack, tooth brush holder, toilet roll holder and robe hook. Side entry into containers, an industrial electric roller door and single entry door to the rear. Wiring, electrical fittings and lighting throughout.Building is still in use and will be available 01/04/2019. The Seascape 60 Granny Flat Kit on Full C-Purlin Galvanised Chassis. - Horizontal Corrugated Iron Roof Sheets . - FC Tile Underlay for Bathroom. - Corrugated Iron Roof Sheets . - Full C-Purlin Galvanised Chassis. If you would like to place a customized order (a cabin with titles, change of colour and/or different layout etc) give us a call and we will provide you with a quote. The cabin in the photos is our 8x4 unit, a price list for various sizes is below. 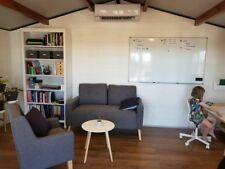 Granny Flat - Office - Worksite - Outback/Remote Cabin. 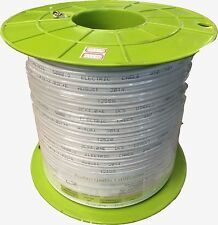 Roof: Colour Bonded Steel Insulated. Illustrations vary from supplied cabin (e.g Furniture & Kitchen not included). Walls: 75mm Colour Bonded Sandwich Panel. Kitchenette - cold water with plumbing - stainless steel sink with mixer tap, counter, drawers and space for bar fridge. Fully plumbed with hot water service and working sink. 40' A Grade HC - Wind, Water and Vermin Proof, Structurally Sound, Lockable High Cube Container. We can prepare plans and approvals on your behalf. 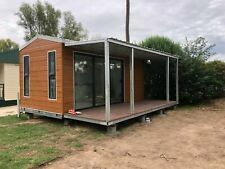 Be very careful of cheaponline kits which advertise as Granny Flats, those do not pass Australian Standards and Most Councils don’t accept them. Nicest looking Granny Flat on the market. The Seascape 60 Granny Flat Kit for your Concrete Slab. - Horizontal Corrugated Iron Wall Sheets . - Corrugated Iron Roof Sheets . The photos attached a steel floor system which is not included in the advertised price. Other designs from one 20ft unit to multiples. Powell Construction 04299 123 85. Happy to organise on your behalf. Full external cladding kit (standard colorbond) – Many other options available upon request. Standard Entry door (sliding, Stacker, Bifold or many other options available upon request. ). 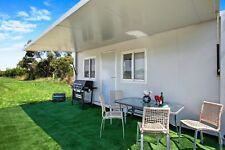 Transportable Kit Home, TWO BEDROOM OR THREE BEDROOM square. 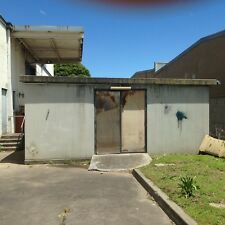 Ø No of Bathroom: includes minimum 3 Star accessories, toilet suite, glass shower cubicle with flick mixer tap on vanity, plus shaving cabinet with mirror. 2/3 BEDROOM LOUNGE AREA KITCHEN BATHROOM Staircase. Units shown in photos are sold on orders. Structures built off-site, such as modular prefabricated buildings, are available for delivery in a few months as compared to stick-built construction that takes upwards of nine months. Builders comply to the same standards used in conventional construction, which makes this type of building an appealing alternative. There are numerous choices, whether you need an office, home, or shed placed on your property. A relocatable home is not on wheels or considered a caravan home. This type of home sits on a permanent foundation that house movers can transport from one location to another. Once delivered to your property, a contractor puts in new footings and foundation to accommodate the relocated home. Homes built in factories are also relocatable since builders construct one or more modular units on flatbed trailers and place them on a foundation onsite with the use of a crane. Senior citizens, young adults just starting out, and others may prefer a smaller space, such as a granny flat, that requires less maintenance and upkeep. The space normally includes a large living area, one or more bedrooms, a kitchen, and a bath. There's also enough space to put in a laundry room. These buildings are stand-alone structures or attach to an existing dwelling belonging to a parent or child. Once you no longer need a granny flat or move to another residence, the building is suitable as a rental property. Factory workers put together portable site offices in a controlled environment following approved architectural blueprints. If you need a larger office complex, it is possible to stack or join several units to increase the square footage. Should you need to relocate your business in the future, you can transport the building to other property. The buildings normally contain a steel frame, aluminium windows, and other high-quality materials and amenities found in conventional structures. Your dream of owning a cabin can come true by purchasing a prefabricated dwelling using an existing plan or custom one designed by you and the manufacturer. The cabin can be a one-room building or include as many bedrooms and baths as you need. Use the space as your full-time residence or vacation home.